KVK-Bishnupur, Manipur celebrated Sankalp Se Siddhi-New India Manthan on the 25th August 2017. 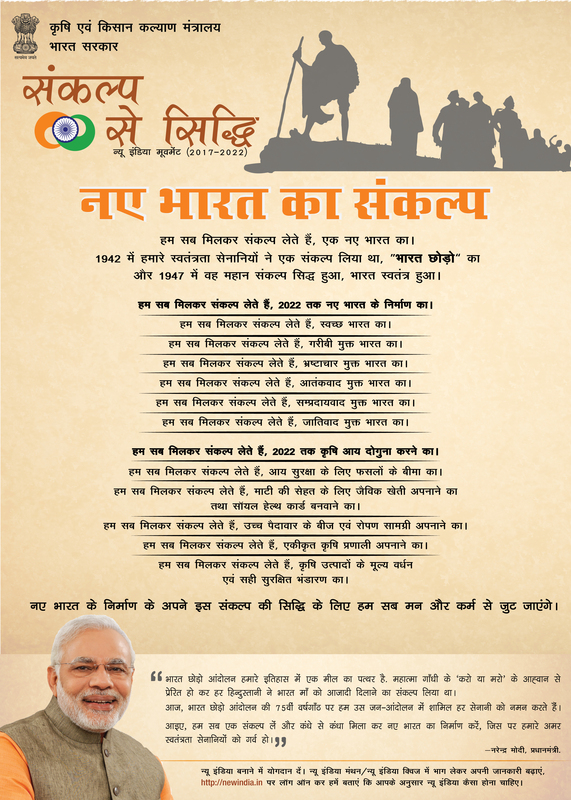 The programme started with pledge taking administered by the Chief Guest, Shri Th. Shyamkumar Singh (Hon’ble Minister of Horticulture & Soil Conservation, GOM). After the speech of Chief Guest, President, Guest of Honour and Functional Host programme was followed by Technical Session on the topic "Doubling of Farmers Income by 2022" by five technical experts. Before the Technical Session a short video- Agriculture -KISAN FILM 2017 and Film-Gandhi was shown. Shri Th. Chaoba Singh as President (Ex-Union Minister, GOI & Ex-Deputy CM, GOM, Chairman-KVK), Dr. Bidyut C. Deka as guest of Honour (Director, Agricultural Technology Application Research Institute (ATARI), Umiam, Barapani, Meghalaya, Dr. R.K. Imotomba Singh as Host Functional (Sr. Scientist & Head of KVK), officers of the State Departments and About 200 farmers of Bishnupur district, participated.